Last week, while still recovering from my post-long-weekend fog, I happened upon this gem of hatefulness on Facebook. Hatefulness is everywhere, but this particular example got my attention for the way it effortlessly blends excessive faith in Police competence with a sort of bleak cynicism about Police competence. 1. Those who get involved with the police have no human rights (they deserve to be treated badly, and in fact will be treated badly). 2. Avoiding involvement with the police is something an individual can choose to do. The first assumption is just wrong. No one gives up their human rights, ever – not by breaking the law or by any other means. No one deserves to be beaten, illegally detained, denied due process, etc. These are rights we have, not by virtue of obeying the law, but by virtue of being born human. It’s also insulting to police officers, who after all are human beings, to suggest that they will inevitably treat badly anyone who comes into their power. The second assumption is wrong for two reasons. 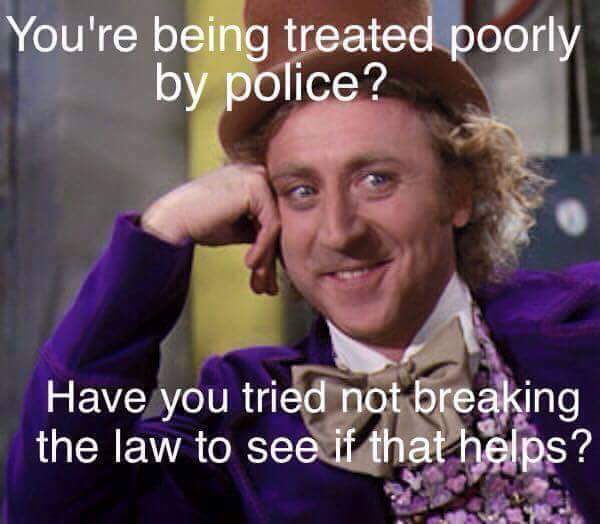 First, simply obeying the law doesn’t and shouldn’t guarantee a lack of involvement with police. It’s not the job of police to determine if someone has broken the law or not. That’s what the courts are there for. Police are there merely to refer possible lawbreakers to the courts. Under this system, we expect non-lawbreakers to sometimes get arrested; if that never happened, and every single person arrested was obviously a criminal, we wouldn’t need judges. Second, and more importantly, choosing to avoid police is something that certain groups in society have more freedom to do than others. Just obeying the law is nowhere near enough to keep some people free from police involvement. White people can avoid police far more easily than people of colour. Women more easily than men. Middle-aged people more easily than youth. Think: if a group of young Maori men happens to walk past a police officer on the street at night, what are the odds that they’ll be stopped for a chat? 50 percent? 60? What if it was a group of white women in their forties? 20 percent? The above thought experiment is an example of privilege. Many of my economist colleagues are wary of the concept of privilege (skepticism about new ideas is part of the job of an economist). But this example shows that it can be useful: privilege distorts the level of police interaction a person experiences, and consequently their chance of a negative experience with police. That potentially changes the attitudes of a whole group of people to the police, the law, and society as a whole. Immediately this group of people is on a much tougher life path through no fault of their own, and no one even committed a crime yet. Changing that power structure in society is hard, but understanding human rights is easy. A human person who’s been stopped or arrested or tried or imprisoned is still human. They have the same rights as everyone else to life, liberty (except when fairly found guilty), safety and freedom of thought. These rights aren’t a reward for obeying the law. They’re part of being human. I saw that meme too. Didn’t have the energy to engage with it as you have here — so, thank you for that.